I am fascinated by traditional Indian patterns. These pattern forms are widely available in all temple sculptures, wooden frames and so on. The embroidery types of India also incorporate these patterns widely. One such embroidery type is Kantha work from Bengal.There are so many sarees , bedcovers, cushions , wall hangings, bags, pouches, purses, blouses, dress materials embellished with this embroidery. Some times folk designs are also done. I have done a few tunics and blouse in this type of embroidery. This tunic is green mangalagiri handloom cotton fabric. 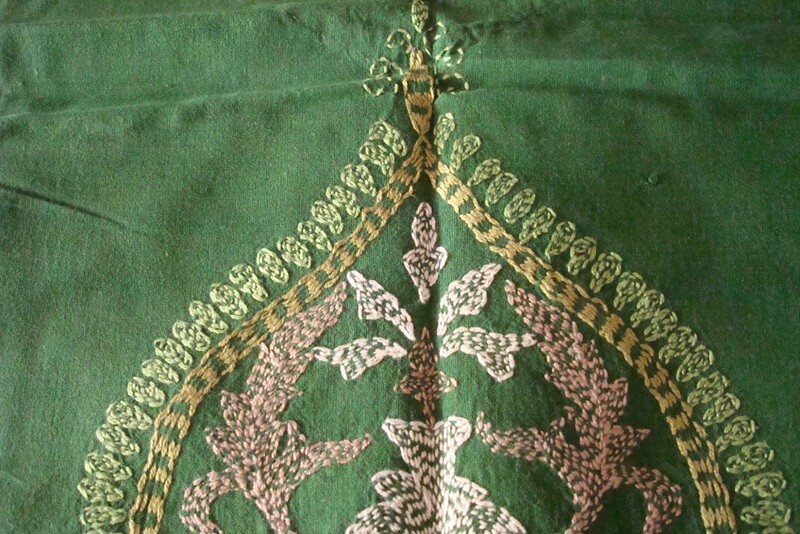 It had a grayish green woven border, the salwar [ Indian pants] material was in this colour too. The pattern- This is a traditional Indian motif pattern, this kind of pattern can be made in any size , depending on the requirement. In this pattern I concentrated mainly on the border line, thought the pattern will look great with kantha work on them. 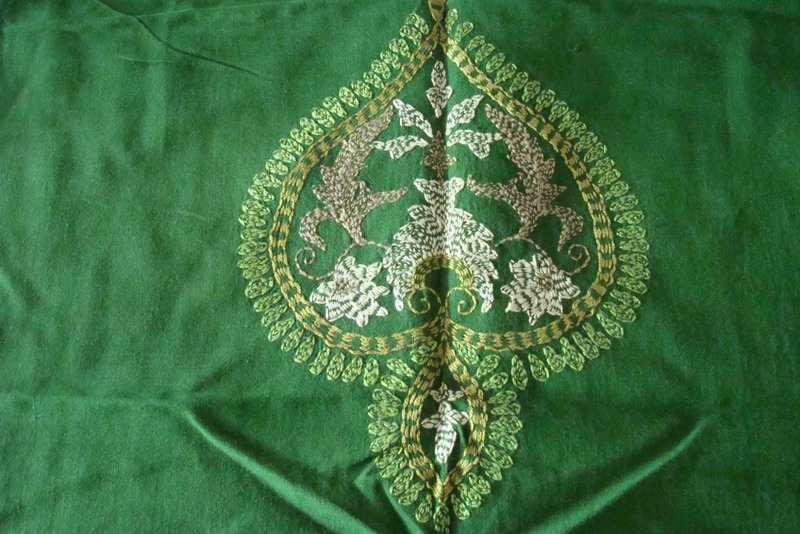 Embroidery- colours- A few shades of green was used for the pattern. 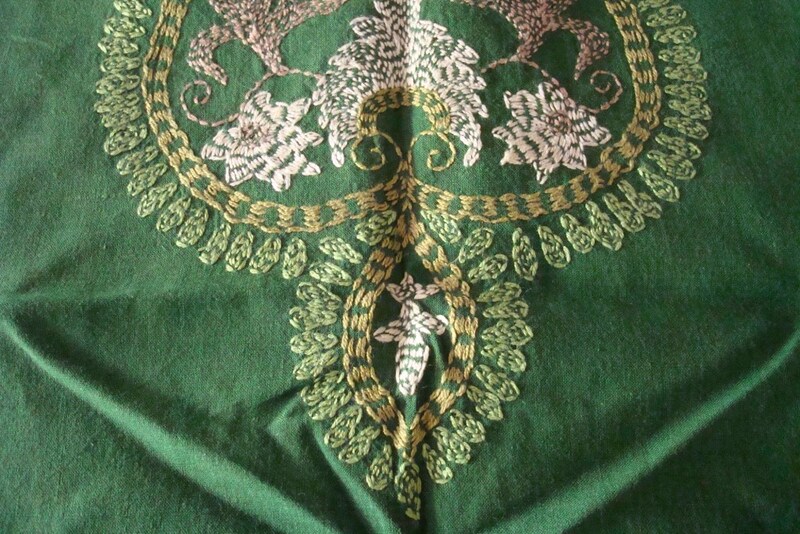 The whole design was done in running stitch as it is common in kantha work. I wanted the design to look like weave rather than embroidery, so that it will appear as if it is part of the fabric. This work was done ten years ago, still one of my favourites, though I can’t say green is my most favourite colour, I do seem to have too many green dresses!